Never have we been more excited about new millinery fashions than we are right now! They’ve never been so dramatic, so inspired, so different–and with it all–so wearable. And never has your hat been more important as a definite part of your ensemble–asa bold accent of color, perhaps, to lend your costume spice. Its selection, therefore, is a matter of thought and consideration Leschin’s is well able to render. Just to give you a birds eye view of our spring millinery selection, we are sending these sketches to you. We hope they’ll intrigue you enough to make you come in and let us find YOUR hat for you. For whether you plan to look tailored or acquire the devastatingly feminine Margot look, we have the perfect hat to complete your costume picture. You’ll note two very amazing things, too–that you may pick up a casual little hat for as low as $7.50–AND–you may have an exclusive model made in our workroom for as little as $12.50–and that IS news! An accomplished businesswoman and prominent academic, Saunders made her mark on the university as a determined scholar and educator. She earned her Bachelor’s (1907) then Master’s (1910) degrees in English and later returned to the university as an Instructor of Business English in 1918. 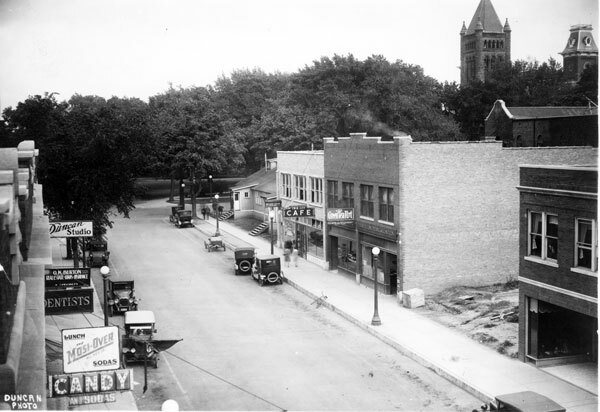 Having successfully helped run a household of four sisters, founded the Delta Gamma sorority, opened and managed The Green Teapot tea room, and co-managed the Flat Iron Department Store, Saunders’ practical business experience was both diverse and exemplary. 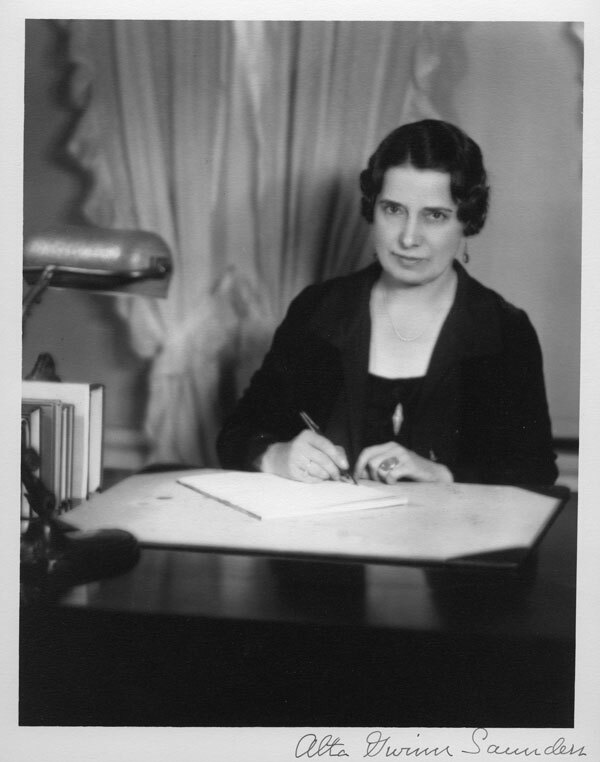 By 1925, she had been appointed as an Associate Professor of Business English and ten years later, she helped found the American Business Writing Association (later renamed the Association for Business Communication). In 1938, at a time when women were almost universally shut out of the upper levels of academe, Saunders’ accomplishments earned her promotion to the rank of Full Professor. A description of the full collection, Alta Gwinn Saunders Publications, 1929-1951 (Record Series 9/2/27), is now available. For more information on Alta Gwinn Saunders, her achievements, and publications, visit the University Archives and browse her file in the Alumni and Faculty Biographical (Alumni News Morgue) File, 1882-1995 (Record Series 26/4/1), or contact the archives for information on requesting access to her file in the Staff Appointments File, 1905-2001 (Record Series 2/5/15). Spindel, Carol, “Alta Gwinn Saunders: The Invention of Business English,” The University of Illinois: Engine of Innovation, ed. Frederick E. Hoxie, (Champaign, IL: University of Illinois Press, 2017), 66. https://muse.jhu.edu/book/49860. Saunders, Alta Gwinn, Effective Business English, 2nd edition, (New York: The MacMillan Company, 1939), v.
 Effective Business English, 26-7, 33. Saunders, Alta Gwinn, Your Application Letter, (Urbana: University of Illinois Supply Store, 1925), Conclusion. Students work on arranging and describing Kenneth Appel’s Papers. From October to November 2017, the Illinois Geometry Lab’s program devoted to showcasing undergraduate Mathematics students’ research worked with the University Archives to arrange and describe Kenneth Appel’s personal papers. In 1976, Kenneth Appel and his colleague Wolfgang Haken (both Mathematics faculty members at the University of Illinois), succeeded in proving the “Four Color Theorem.” This theorem argues that every map in a plane or a sphere can be colored with only four colors in such a way that no two countries of the same color are touching. By that time, mathematicians had been working to prove this theory for over one hundred years. In fact, it took hundreds of hours of computing work for Appel and Haken to prove it. The announcement that the theory had been proven was met with a flood of people writing to them. Some were writing to congratulate the team and others to prove the team wrong. The students worked alongside the archives staff to learn more about the archival process by appraising the material, arranging and describing it, and rehousing the materials in archival boxes, all while taking an historical approach to mathematics, using primary sources to learn more about Appel, his research, and the ways in which the mathematics community reacted to what was then a controversial finding. Kenneth Appel’s Papers include correspondence relating to the Four Color Theorem that illustrates both in number and in tone, the storm of letters that Appel and Haken were bombarded with at the time. Some notable letters include a teacher that says his eighth graders were able to prove the theory wrong and an account of a $100 bet that was made that the theory could not be solved by July 1976, including a photocopy of the $104 dollar check (the four dollars being paid for “interest”). The record series also includes publicity materials, drafts of papers, and data printouts and computer punch cards, much of which relates to the Four Color Theorem. On Saturday, November 4, 2017, the students will host an exhibit featuring materials from the collection. The exhibit will be a part of the Illinois Geometry Lab Open House which is being held in conjunction with the Department of Mathematics’ Four Color Fest, an event being held to celebrate the 40th anniversary of the proof. You can also see the exhibit in room 146, University Archives, December 8, 2017-January 31, 2018! 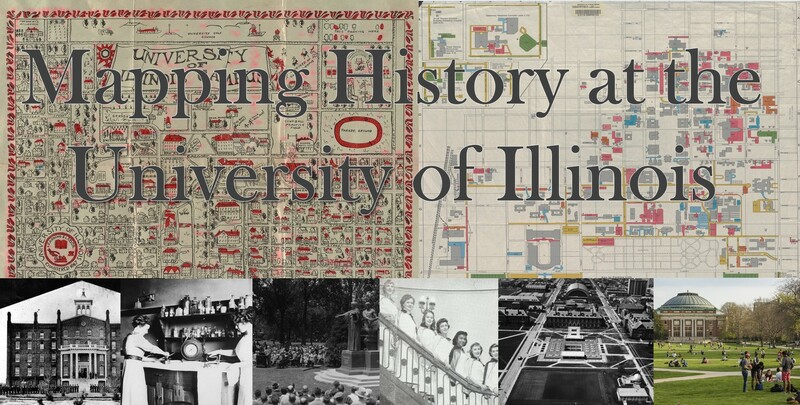 In January 2016, James Whitacre (GIS Specialist), Marci Uihlein (Professor/Architecture), and Ellen Swain (Student Life and Culture Archivist) received Library Innovation Funds to develop a project entitled Mapping History at the University of Illinois—a “bringing together” of GIS, architecture and archives to tell the University’s story in time for the Sesquicentennial year. Interactive Campus Maps: GIS time-enabled map; 3-D modeling, and story maps produced (with James Whitacre’s assistance) by Joe Porto, Scholarly Commons graduate assistant, undergraduate student assistants and interns. Jessica Ballard, Archives Faculty Resident, created the African American Housing history map. Digital Map Archives: 525 campus, community and county maps from University Archives, Map Library and Champaign County Historical Archives holdings, conserved by Conservation and digitized by Digital Services. Through this project, we hope to inspire and showcase student scholarship about the University of Illinois. We are continually adding new content. The University of Illinois has made many contributions to different fields of knowledge throughout its history; an important aspect of this history is Illinois’ contributions to modern dance. Although dance performances were taking place at Illinois as early as 1898 through, for example, the May Fête celebrations, the early 20th century saw dance at Illinois evolve from a recreational activity such as the May Fête to high-end artistic and academic education. By 1920, the Department of Physical Education for Women offered academic credits for two dance classes: “interpretative” and “natural” dance (see the Dance Department’s history page). However, it was Professor Margaret Erlanger whose work lead to the re-interpretation of dance in the University as a form of art and an academic subject, beyond its recreational and athletic dimensions. Erlanger came to Illinois in 1948 to the Department of Physical Ed for Women, and that same year began to work intensively to push forward the creation of a Dance Division that would offer a B.A. in Dance. By then, only ten schools across the country were offering a degree in Dance, as Erlanger notes in a May 2nd 1949 letter to the director of Physical Education (letter linked through the image below, page 4). Erlanger, one of the first graduates from the pioneer program at the University of Wisconsin led by Margaret H’Doubler, addressed University administrators with strong arguments about the emergence of Modern Dance, the importance of implementing an academic program at Illinois, and the increasing demand of dance education in the country. Through intense work in developing proposals for a dance curriculum, gaining support from colleagues, and convincing administrators of the value of the field, in 1949–only one year after Erlanger’s arrival on campus–she created a curriculum for a specialization in dance within the B.S. degree program for Physical Education. From there, the path of academic education in dance at Illinois began, creating a M.A. in 1959 and a B.A. in 1962. The vibrant environment of the Dance Division drew such dance legends as José Limon and Agnes de Mille, who performed on campus as early as 1953 and 1954 respectively. The Dance Division also invited the internationally influential artist Ann Harplin to direct a piece with the Division’s group Orchesis (1957). Notably, Illinois became the first school with a Dancer-in-residence permanent position in 1959. The first dancer holding this position was no other than Merce Cunningham. Cunningham taught on campus, created pieces for dance students and for himself, which were showed on campus in a concert at the end of his residency. Cunningham and company returned to Illinois in several occasions to teach and show work, which included several collaborations with contemporary music legend John Cage. A highlight of these collaborations was the 1967 concert for the University festival “Matrix for the Arts,” which was part of the University’s Centennial celebration. For that concert, Cage staged a “Happening” at the Stock Pavilion, at a time when “Happenings” as contemporary art forms had appeared only about ten years before. During the 1950s and 60s several other dance legends visited Illinois as dancers in residence, including Katherine Litz, Paul Taylor, Anna Sokolow, Alwin Nikolais, Steve Paxton and Katharine Dunham. The opportunity of having professional companies teaching and creating work on campus, made of Dance at Illinois a pioneer in dance education, and made of that Department a unique environment for artistic experimentation. It attracted such world-renown dancers as Beverly Blossom and Joan Skinner, who eventually became dance faculty members. Skinner obtained her Master’s from Illinois (1964) and while teaching at the University, developed the “Skinner release technique” which transformed the modern dance education and put somatic education at the forefront of dance education. This environment made of Illinois a center for the evolution of modern and contemporary dance, as well as the “somatic meca” that it is today as noted Nancy Wozny in 2012 for “Dance Magazine.” Three dancers have received an Honorary Doctorate Degree from the University: Merce Cunningham, Alwin Nikolais, and Katherine Durham. 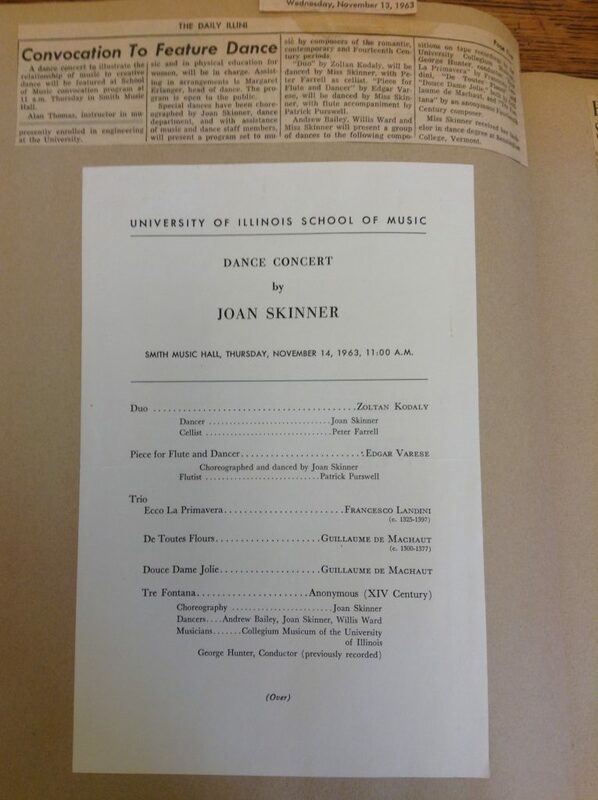 Program of Joann Skinner’s 1963 dance concert for obtaining her MA fro Illinois. M. Erlanger Papers (12/13/20), Scrapbook 14. Through the movement initiated by Professor Erlanger, which was strengthened by the dancers, choreographers, and educators that became part of this process, Dance at Illinois made dance a language of research, innovation, and artistic excellence. This post is a complement of the exhibit “Dance at Illinois. Milestones and contributions” installed at the Marshall Gallery from the Main Library between May 2nd and through June 30th, 2017. 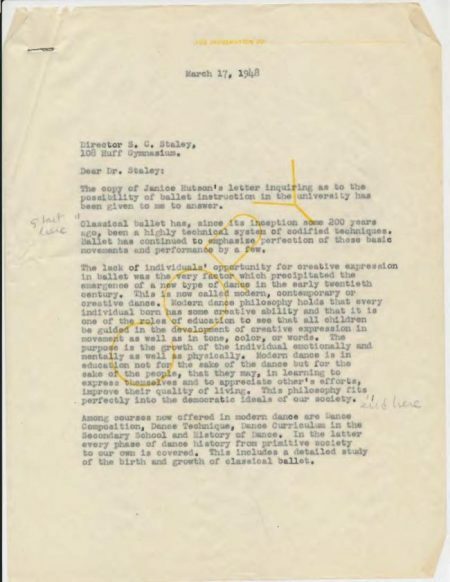 For more information about this topic, you can visit the University Archives, and browse the series: Margaret Erlanger’s papers (Series 12/13/20), Dance Department Records (12/13/1), Dance Programs (RS 12/13/805), and Archives Exhibits File (Series 35/3/54). Heinz von Foerster (left) and W. Ross Ashby (right), found in record series 39/1/11, box 3. 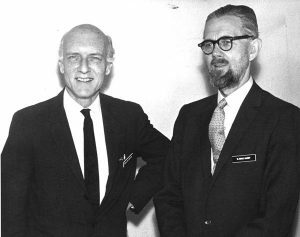 The W. Ross Ashby Papers are held by the British Library. 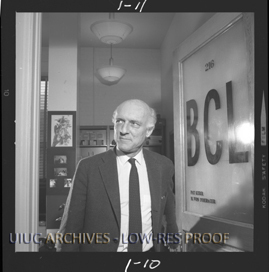 The University of Illinois Archives preserves the Heinz von Foerster Papers. Heinz von Foerster exits the Biological Computer Laboratory office in the Electrical Engineering Research Laboratory at the University of Illinois, found in record series 39/1/11, box 94. 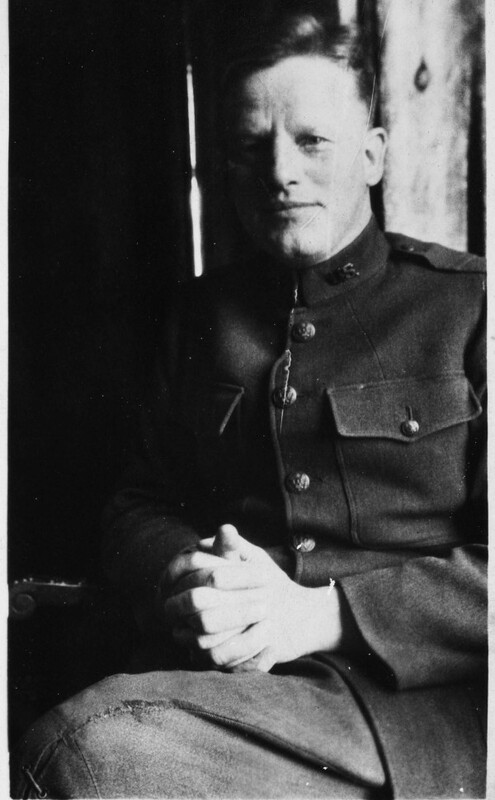 The University Archives has a new online exhibit featuring the papers of Watson F. Lewis, who signed up to be an international secretary for the YMCA at the end of World War I. The papers were donated by Marjorie L. Lewis, Watson Lewis’s daughter, who earned her Ph.D. in Psychology from the University. These papers include letters from Lewis to his wife describing his travels and work in Russia and China between 1918 and 1921, as well as souvenirs from his travels, books, YMCA dispatches, and many photographs. The new exhibit introduces this collection, particularly the letters, which are a rare example of a first-person account in English about this area of the world in the early 20th century. 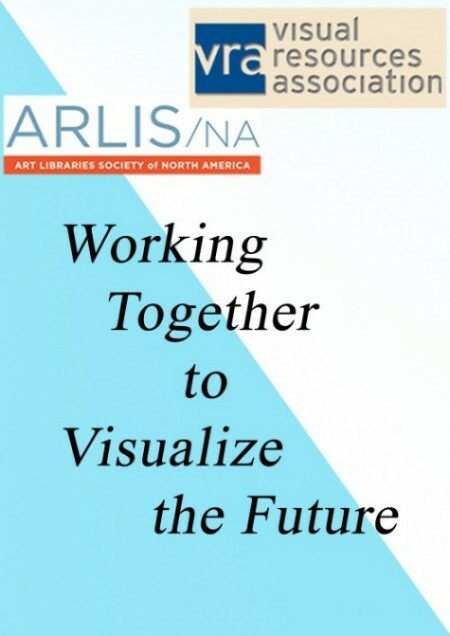 As the Art Libraries Society of North America (ARLIS/NA) and the Visual Resources Association (VRA) begin their third-ever joint conference, we look back at the 12th Summer Educational Institute for Visual Resources and Image Management (SEI), co-sponsored by ARLIS/NA and the VRA Foundation, which took place June 9-12, 2015, on the University of Illinois at Urbana-Champaign campus. 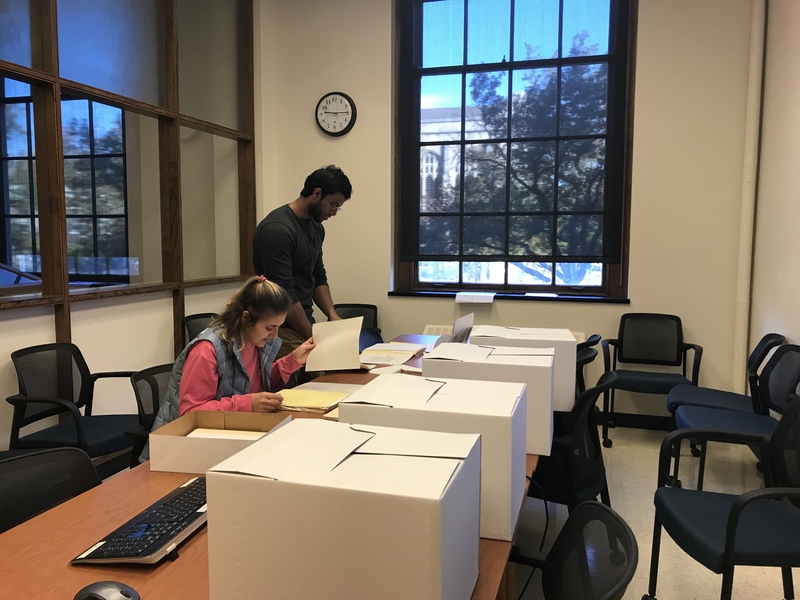 It provided the opportunity to highlight some of the holdings of the ARLIS/NA Archives, which are held by the University of Illinois Archives. Missed the live exhibit? See it online here!